Murthy J. The Worlds of Isaac Asimov: Modeling Kalgash: Jayant Murthy. The Galactic Inquirer. 2015 Feb 6 [last modified: 2015 Jul 19]. Edition 1. Isaac Asimov, Arthur Clarke and Robert Heinlein are usually counted as the Big Three of science fiction, amongst the most influential writers in the field. They all were early protégés of the legendary John Campbell, editor of Astounding Science Fiction and were the faces of the Golden Age of Science Fiction when technology was supreme and it was clear that we were headed to the stars. Asimov (shown on the left from Marcio Kenobi) was born in Petrovichi, Russia with an official birthdate of Jan. 2, 1920 – although there is some confusion about the exact date. He moved to New York with his family when he was three. Azimov was a voracious reader with a phenomenal memory which he later used to good effect with books ranging from Asimov’s Guide to the Bible and Asimov’s Annotated Paradise Lost to Lecherous Limericks to The Black Widowers, a series of mysteries. He first started writing science fiction with “Marooned off Vesta” which was sold to Amazing Stories in 1938 (appeared in 1939) and continued with extraordinary fecundity until about Sputnik (1957) when he almost entirely switched to writing science books which he found easier and more profitable. “Nightfall” was his 32nd story (in two years!) 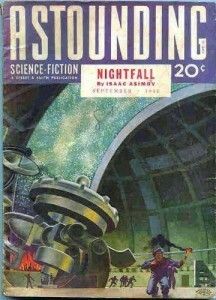 and was published in the September, 1941 issue of Astounding Science Fiction. It immediately made the young Asimov a big name in science fiction and is now a prime candidate for the best science fiction short story ever written and, indeed, was voted as such by the Science Fiction Writers of America in 1965. The original short story (cover shown on left) was suggested to Asimov by Campbell who came across a quotation from Ralph Waldo Emerson “If the stars should appear one night in a thousand years, how would men believe and adore, and preserve for many generations the remembrance of the city of God!” Campbell thought that men would rather be driven mad by the unexpected sight of the stars. The planet Kalgash (all names follow that of the book Nightfall by Asimov and Silverberg described below) orbits a Sun-like star but is in a system with 5 other stars which conspire such that at least one of the stars is always in the sky. As a result, there has not been darkness in recorded history and exposure to darkness drives those exposed to become literally mad and sometimes even to die. No other stars are visible and the motions of the suns in this system are complex enough that the Law of Gravitation was only discovered a few years before the start of the story. It soon becomes apparent to the scientists, but not to the general public, that there are regular cycles of civilizational collapse every 2049 years. As one of the critical elements of the story, these cycles are recorded in the histories of a religious sect which claims that the cycles correspond to periods of darkness when the sky is filled with stars. The world then descends into fire and madness and civilization collapses. Coincidentally, a group of astronomers finds that there are discrepancies in the motions of the suns and thus problems with the Law of Gravitation. These discrepancies could be resolved if Kalgash had a moon invisible to the eye except when it eclipses one of the stars. Imagine their shock when they discover that these eclipses occur every 2049 years with the next slated to occur at exactly the same time as foretold in the religious books. Furthermore the eclipse occurs when there is only one star in the sky hence plunging the world into darkness. The short story ends with the scientists driven mad by the sight of the 30,000 stars from a nearby cluster while the world ends once again in fire. The stars prove to be the push to insanity and tie back neatly to the original Emerson quote. The story was later expanded into a full length novel (1991) in collaboration with Robert Silverberg which continues with the rebuilding of civilization after the collapse, essentially as a theocracy. Nightfall was written only a decade after Clyde Tombaugh observed Pluto and no hint of any extrasolar planets had been seen. However, this was no bar on the imaginations of the writers of the Golden Age, as evidenced by the wide variety of worlds and life forms that they described. 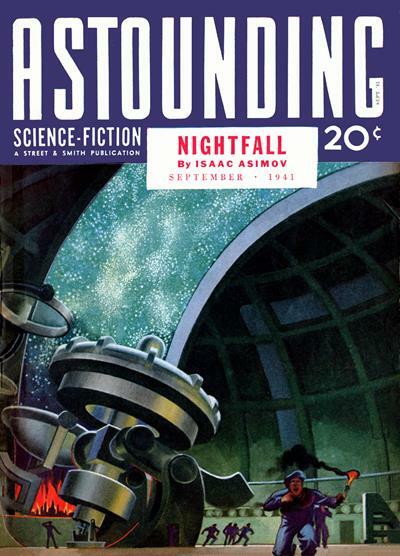 Nightfall was one of the first stories to focus on the social aspects of alien astronomical situations, whereby Asimov set up a planetary system which would meet his requirements. He most likely did not put much thought into whether such a system was indeed possible nor is it relevant to the story he is trying to tell. Having been idly curious about the physical characteristics of the Nightfall system for several years, I have since collaborated with Smaran Deshmukh to at least work out the gross characteristics. I note that many multi-star systems are now being found using Kepler data including a 4 star system (Kepler-64; visualized above by Dirk Terrell) so perhaps the Kalgash system is not as far-fetched as it may have seemed at one time. The novel provides many more details of the system than the short story and we have used that as the inputs for our model. Note that the names in the novel are different, for no apparent reason, than in the original and, for consistency, we have used names from the novel. I will not give the full details of our modeling here; our paper may be consulted for that. We have also attempted a simulation of the entire system using a proper gravitational model but were not successful given the time available for the project. In this article, I will simply describe the major constraints placed on the system and how we converted those into a description of the system. Because Asimov was most interested in the social aspects of a world without darkness, there are relatively few clues about the kind of system and, as I mentioned earlier, these were largely to give an alien feel to the story. The distance scale was set by the 10 light minute (1.2 AU) distance of Kalgash from its main sun (Onos) and the maximum distance of 110 light minutes (13.4 AU) for the system’s farthest star from Kalgash. For perspective, this puts Kalgash at just outside the orbit of the Earth and the farthest star at just inside the orbit of Saturn. 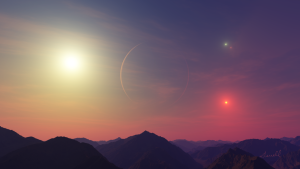 Four of the 6 stars are in two pairs of binary stars and are all white stars. Very little was known about stellar evolution at the time and it is likely that Asimov just assumed they were normal A type stars, if he thought about it at all. Remember that the story was written two years before the standard Morgan-Keenan stellar classification system was derived. However, main sequence A stars are much too bright for the parameters in the story and would make life impossible on Kalgash, and so we have assumed that all four stars are white dwarfs with brightnesses at the planet of 50 to 100 times that of the full Moon at the Earth. In our own work, we focused on the critical actors in the story: the red star Dovim and the moon Kalgash 2. Darkness occurs once in 2049 years when Dovim is the only sun in the sky and Kalgash 2 passes in front of it. The star itself is dim and red and therefore must be a red dwarf which we have assumed to be an M0 main sequence star. We know that the star is bright enough that the stars of a nearby cluster are drowned out. Extrapolating from our own Earth, the apparent magnitude of the Sun is -26.74 with the faintest object visible in the daytime being about -4th magnitude, a difference of about 22.5 magnitudes. 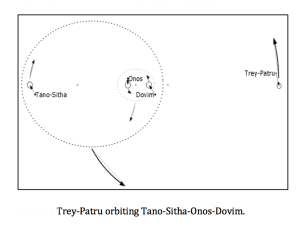 If we take the brightness of the stars in the cluster to be 0th magnitude, this puts Dovim at a distance of 44 light minutes from Onos (the parent star of Kalgash) which in turn gives it an angular diameter at the planet of 3 – 5 arcminutes. By comparison, the angular diameters of the Sun and Moon at the Earth are both 30 arcminutes. We know from the story that the angular diameter of Kalgash 2 is 7 times that of Dovim (21 – 35 arcminutes) and that an eclipse must last a minimum of 9 hours, compared to less than 8 minutes on the Earth. The reason for such a long eclipse is that civilization must collapse over the entire planet and thus must last over much of the planetary day which is implied to be similar to an Earth day. 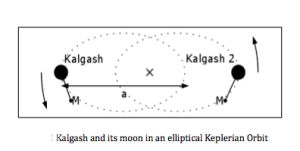 We also know that the mass of Kalgash 2 is about the same as that of Kalgash and that the eclipse occurs when the moon is closest to the planet. From Kepler’s Laws, the moon moves fastest when it is closest to the planet which is, of course, when it is its largest in the sky. Again using Kepler’s Laws, we derived a relationship between the actual size of Kalgash 2 and the length of the eclipse (see the paper for details). It is only possible to have an eclipse that long if the size and density of the moon is similar to that of the giant planets; i.e., a density close to that of water. We ignore here how such a system might have formed taking recourse in the unlimited imaginations of the science fiction writer and the Universe. 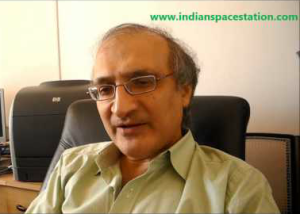 Jayant Murthy is Senior Professor at the Indian Institute of Astrophysics in Bangalore (see http://www.iiap.res.in/people/personnel/murthy/Jayant_Murthy/Homehtml). His scientific background includes research positions at NASA’s Goddard Space Flight Center and The Johns Hopkins University, where he developed expertise in space missions, interstellar dust, and diffuse radiation fields. He has a TEDx talk on “A Paradigm Shift in Space-based Astronomy” at https://www.youtube.com/watch?v=4sRiFdTdrz0. The short story is at https://www.uni.edu/morgans/astro/course/nightfall.pdf. Our model is at http://arxiv.org/abs/1407.4895. Wikipedia is, as always, a superb resource for information on Asimov and on Nightfall. 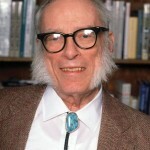 Further details on Asimov are at the Asimov FAQ, a treasure trove of information. This article was an interesting read as it introduced one of the well known works of Issac Asimov as a possible system by modeling the suns and how they would permit an eclipse. Though it would be interesting to hear of how the 2000 year process would occur it isn’t required to understand this. The other five suns are minor in comparison, but provide enough light to prevent the inhabitants of Kalgash from defining “night”. From what can be drawn from the text, Onos, the star appearing brightest and largest in Kalgash’s sky, is the star that Kalgash orbits.